Malleefowl dedicate 9-11 months per year building and maintaining a large incubation mound of soil, leaves and twigs. 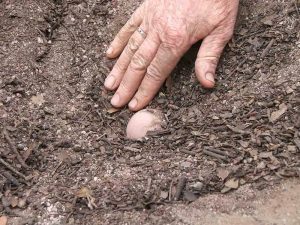 The eggs are laid in the mound, buried and left to incubate by heat generated from composting litter. Malleefowl mounds may be used over many generations and can attain an impressive size of 22 metres in circumference and one metre high. Breeding densities vary. Surveys in South Western Australia indicate an average population of 2 active mounds per square km in 400 mm rainfall mallee habitat areas (Ongerup region). Malleefowl have developed a highly sophisticated method of temperature control for egg incubation. The birds maintain the mound temperature of 32-34 degrees by using their beak as a “thermometer” and adjusting soil cover to either retain or expel heat from the egg chamber. Towards the end of the breeding season (February – March) when heat generated from litter fermentation has diminished, solar energy is harvested by spreading and returning mound soil heated by the sun.